Indian Khana, Made Easy: My Foodilicious Weekend! What can I say except I absolutely loved the weather this past weekend. It certainly brightened up my mood for doing errands and some good ol' home cooking. Friday night my mom made Sarvapindi, a dish planned for Mothers' day for her mom but was postponed because we were all sick at that time. After dinner, we played rummy (different from gin rummy and played with 13 cards) and ate rasmalai. Guess who won 3 times in a row? Me, of course. The next day, my dad and I went to work for a few hours to unpack boxes and rearrange furniture in our new office. I'm not a fan of working on weekends but I knew the sooner we settled in, the easier everything will be for all of us. A productive day deserves a good meal. That night, I made paneer kati rolls for everyone. It's quick and easy especially if you use ready made rotis or plain parathas (I recommend Deep Foods brand). 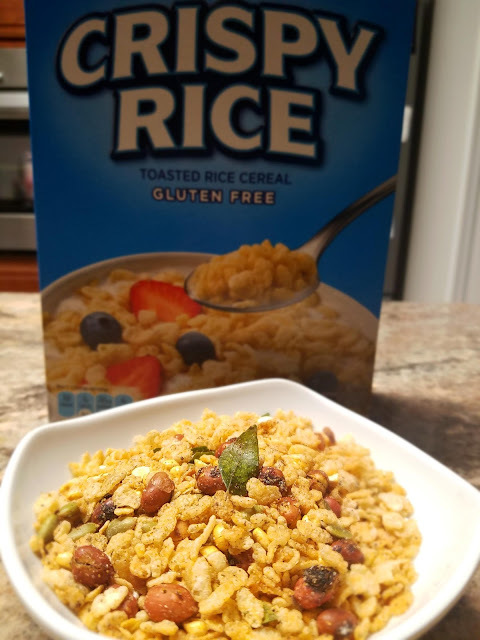 I used to eat these all the time when I was working in the city. They're cheap and filling. Since I worked so much on Saturday, it's only fair that Sunday should be a lazy day. I caught up with all my shows from the week, cleaned my room, and organized my closet. Why does it always feel like time flies by on Sundays? Before I knew it, it was time for dinner. 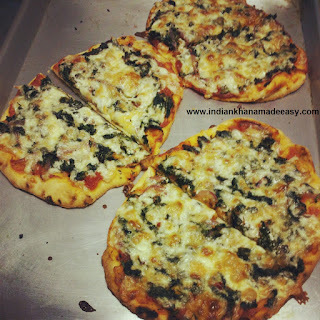 My mom and I made Spinach and Cheese Naan Pizza. Oh Goody! Pizza is my grandma's favorite American food. I wonder why? Any guesses. She loves the crispy, crunchy crust and the stringy cheese. We love it because it's easy to make and it's foodilicious!! We sauteed a bag of frozen spinach and red onions with ginger-garlic paste, salt and chili pepper. Then we laid out the naans (from Costco) on a baking tray and spread pizza sauce (you can also use pasta sauce) evenly on them. Next we spooned the seasoned spinach and onion mixture all over and sprinkled the naans with shredded pepper jack cheese (we love the spicy flavor). We popped the trays into the preheated oven (375 degrees) for about 10-15 minutes or until crispy. Have you tried naan pizzas before? What are your favorite toppings? Feel free to share!